Ross Gay’s collection opens gently, though quickly and persuasively, with the assistance of poems like this one—“Ode to the Flute”—where we are immediately challenged with questions of perception and even agency—what an object or person can do, or has the omniscient right to do. This question of agency, in connection with loss and grieving, and nature, recurs again and again across this collection, whether we are talking about a man “turning himself into air” or a flute being “made of a man” or of spreading bits of a father’s ashes so as to place him everywhere—who has the right to do these things, but more importantly, what actually happens when we do these things? But ultimately, that becomes an inane question; the true question, the one that plagued me and accelerated me through this collection (in celebration, I might add) was the question of what the narrator thought or believed happened when he did something… and to me, the answer goes back to that darn painted pipe having the ability to be the pipe itself. The man can turn into air, the flute can be of the man as easily as Eve, the pipe is a pipe, and when we spread a loved one’s ashes over all the lands they used to love, they’ll stick, and their new form of consciousness will remember those places as if they had just visited them again. Grief can be a celebration, and grief can be a doorway into a higher realm of believing. And ultimately, I think what makes this collection work so well, and why it’s able to immerse me so well in these ideas, is just how beautiful beautiful beautiful Ross Gay’s poems are. I know I’m writing a review, and I’m here to say something more, but sometimes you just have to proclaim how wonderful a writer’s work is, and Ross Gay’s collection demands that of me: these are wonderful, determined poems. With the use of such short lines, encapsulating these long, thin poems in so much white space, we are accelerated straight through to the meat and bones of these poems, straight to the heart of them, and the endings of these poems always amaze, delight, and harm (in the best way). These poems are powerful, and they read new every time (which is the greatest compliment I can give—that a collection can keep on surprising me at every turn, every time). Much like nature, much like grief, these poems live in a place of urgency and remembrance and even joy and celebration and praise for nature. Even when we think of the idea of “giving and taking away,” these poems find a way to praise that and find beauty in that return. They are strong, witted, and beautiful. I’ll probably be sharing more of these poems with you tomorrow, but in the meantime, start reading. You’ll understand. 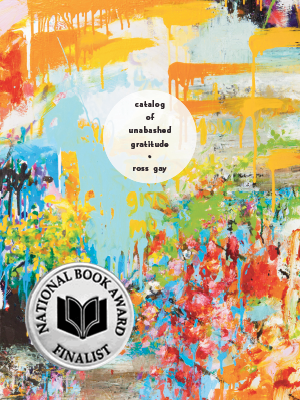 ROSS GAY is the author of three books: Against Which; Bringing the Shovel Down; and Catalog of Unabashed Gratitude, which was a finalist for the 2015 National Book Award in Poetry and is nominated for an NAACP Image Award. He is also the co-author, with Aimee Nezhukumatathil, of the chapbook Lace and Pyrite: Letters from Two Gardens, in addition to being co-author, with Richard Wehrenberg, Jr., of the chapbook, River. He is a founding editor, with Karissa Chen and Patrick Rosal, of the online sports magazine Some Call it Ballin’, in addition to being an editor with the chapbook presses Q Avenue and Ledge Mule Press. Ross is a founding board member of the Bloomington Community Orchard, a non-profit, free-fruit-for-all food justice and joy project. He has received fellowships from Cave Canem, the Bread Loaf Writer’s Conference, and the Guggenheim Foundation. Ross teaches at Indiana University.